First, happy Credit CARD Act day! As I wrote last week, the second phase of the Credit Card Accountability Responsibility and Disclosure Act of 2009 goes into effect today, cracking down on unfair and predatory practices like universal default and unfair interest rate hikes. You can read more about those changes here [PDF]. Sadly, banks are trying awfully hard to pass along the cost of new regulation to their customers. In my post from last week, I told how a Citi Card customer who contacted us here at MoJo could face a $60-a-year fee for—get this—not charging enough money to her card. There’s nothing particularly evil about this—banks will no longer be allowed to charge overdraft fees without your consent, and even I will concede that there are some people who might want this service, so now they have to ask for permission. Of course, it’s a pretty hard and misleading sell: they focus primarily on the issue of funds availability (deposits may not be available immediately), and they try to frighten you with “an unexpected emergency like a highway tow.” If you do get a letter like this and are not sure what it means, remember that the bank will not tell you when you are about to overdraw your account, and it will charge you $34 each time, even multiple times per day, no matter how small the overdraft. For all their convenience, overdrafts can be a nasty, unfair practice; if you calculate the APR from the average overdraft fee, it’s more than 10,000 percent. 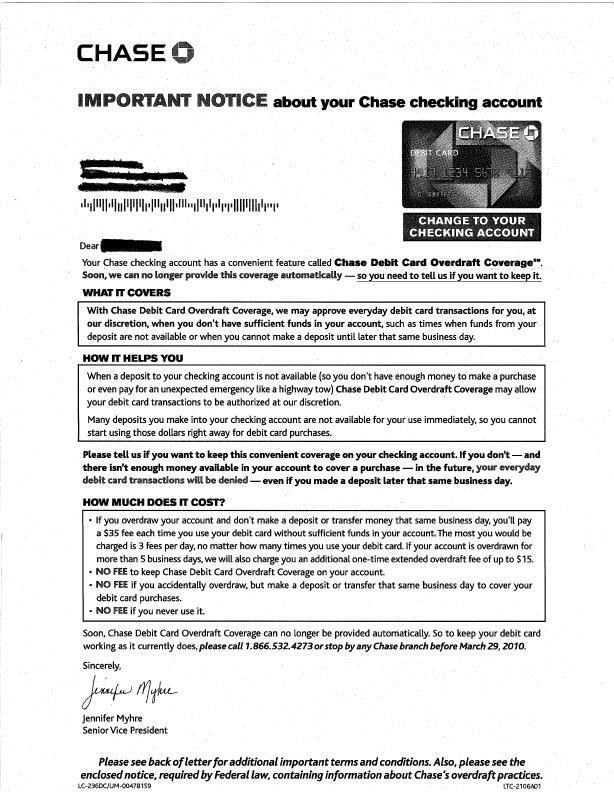 No matter how well Chase or any other bank cloaks the practice is corporatespeak, we’re all better off now with the chance to opt out of overdraft fees.